1. 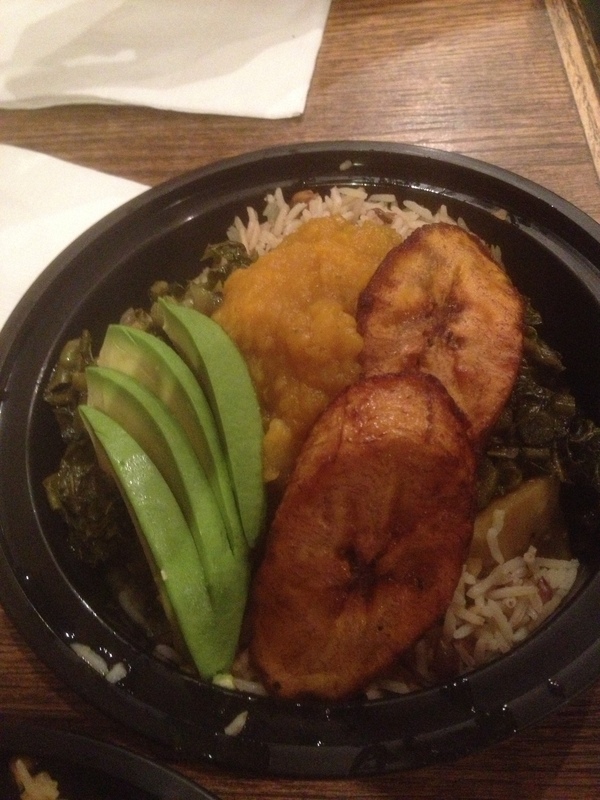 We tried the small Jamaican Spiced Pumpkin Roti with a Whole Wheat Dahl Puri wrap ($5.50), the Callalloo (stewed Jamaican greens that reminded me of grape leaves with yellow yam and avocado; $10.99), the chickpea and potato curry with rice and peas and an organic salad (lettuce with shoots and red pepper; $10.99), and a corn soup. We also sampled the homemade ginger beer, which was spicy but not fizzy. Everything tasted healthy and fresh but didn’t leave me wanting more. 2. The place had a good vibe. Maybe it helped that I was singing the Bob Marley song in my head the whole time. 3. It’s a legit takeout place. There are a few seats but your food will be in take out containers. Not a bad option if you want some healthy/vegetarian/vegan food. I felt good about what I was eating, but I don’t think I’ll be back.